Are you getting booked but wish you could have even more success? Although there is no perfect recipe to getting more bookings, these tips can only help you improve your chances of getting seen and hired. In part one of our new blog series, we’ll start by taking a look at the average profile habits of our best bookers. 8 profile videos and 6 audio files: Have video or audio from your past events? Be sure you add them to your profile. 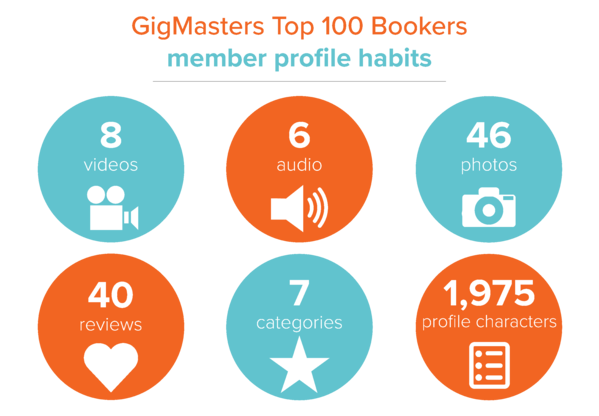 Our best bookers have almost 4 times as many videos than the rest of our members and 2 times more audio. If you have to choose, we recommend videos! They will showcase your skills best and provide a perfect picture of how you’ll fit in to clients’ special events - plus, videos get clicked twice as much as audio! 46 profile photos: Make sure you’re uploading high quality photos of your work to your profile. Getting a sneak peak of your past experience and expertise will make clients feel more comfortable reaching out to you for a quote. Think of it this way: If you’re looking for a place for dinner on Yelp, wouldn’t you be more likely to try a restaurant with a ton of photos from people who have previously dined there versus an establishment with zero photos? 40 reviews: This sounds like a lot of reviews, especially for a new members. However, once you get your first good review, it will lead to many more good ones! This will help build trust with potential clients. Make sure to add our Portable Review Widget to your personal or business website so you can start displaying your rave reviews. This will attract more leads which will help you secure more bookings and client reviews. 7 categories: Listing your service in multiple categories will help you gain more exposure and significantly increase your booking numbers. Of course, you should make sure your services actually fit each and every one of those categories. 1,975 characters in profile description: Make sure you go into detail in your profile description. Clearly explain what you do and why you are so great at it - and do so in full sentences and paragraphs! Clients want to imagine what it would be like to book you for their event so tell them in a way that’s easy to understand, accurate, and professional! Try out some of these tips. We’d love to hear from you if you’ve seen improvement in your booking performance. Comment below!